National Carrier RwandAir is set to launch direct flights from Kigali International Airport to the Democratic Republic of Congo's (DRC) capital Kinshasa. 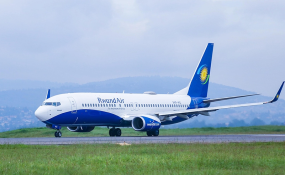 The deal was sealed this week as officials from both countries signed a bilateral service air agreement that will allow RwandAir to fly to Kinshasa. This week, government officials were in DRC where they held a series of meetings including with the country's President Félix Tshisekedi. Among the officials were RwandAir Chief Executive Officer, Yvonne Makolo, and Rwanda Civil Aviation Authority Director General Silas Udahemuka who met officials from DRC's civil aviation authority. Without specifying the dates, Yvonne Makolo told The New Times that they target to launch flights on the Kigali-Kinshasa route in one month time. Makolo said the Kigali-Kinshasa route is viable for both passenger and cargo business and that for a while they have been keen on launching operations on it. DRC is a strategic trading partner with Rwanda. According to central bank data, DRC remains the main destination for Rwanda's informal exports, accounting for 86.9 per cent of Kigali's informal cross boarder exports. RwandAir, which in recent years has been expanding its wings to new destinations as it seeks to reach previously unserved markets, could drive the growth of formal trade between the countries. The national carrier currently serves 26 destinations in Africa, Europe, the Middle East and Asia. The airline will begin flights to Addis Ababa in Ethiopia in April, while Guangzhou in China and Tel Aviv, Israel will also be added to the expanding network, according to officials.